This one hour and fifteen-minute lecture focuses on key developments in visual art since 1965. It builds on ideas presented in Art Since 1950 (Part I) to introduce new artistic formats and practices that continue to influence artists today. The good news: Although the twentieth century is part of our historical past, its culture remains more closely linked to the lives of students today when compared to other topics in the introductory survey. Whenever possible, encourage students to draw connections from the art they are studying to the visual culture that surrounds them. This is a great opportunity to assign students to visit a local gallery, museum, or even your school’s studio art department, either in preparation for class or as a way to synthesize their experience of contemporary art with its position within art history. Have students reflect upon their visits in a short exhibition review, relevance paper, or group discussion in class. If your students have some technology skills, assign them to visit a museum in teams of two or three and record a five- or six-minute conversation about a work of art that can be uploaded and shared with the whole class. The bad news: This lesson plan is limited in scope and does not give full attention to the spectrum of contemporary art that includes architecture, fashion, craft practices, electronic and digital media, performance, graphic arts, and the extensive field of design. Many developments in video (and other time-based media), photography, and formal experiments in sculpture and painting are not discussed in order to focus on historical examples that propelled work by subsequent artists. The rapidly changing landscape of twenty-first-century art ensures much of the art discussed may soon be less relevant—if not completely obsolete—to the student of contemporary art! Look for strategies (like those below) to keep your class current while reinforcing the art historical content that is foundational to this lesson. The strategy: This lesson emphasizes influential art practices that emerged in the 1960s and 1970s and continue to inform creative production today. It considers the motivations that led to the dematerialization of the traditional art object and gave rise to practices of conceptualism, performance, institutional critique, and postmodernism in the late twentieth century. Historical examples may be compared to more recent works of art that build on similar strategies. Such comparisons reveal shared interests while highlighting the conceptual and formal distinctions of different historical contexts. An abundance of online resources allows this lesson to be easily “flipped.” The provocative nature of much contemporary art can incite excellent discussion and encourage more student-directed learning and synthetic processing of new ideas. Instructors might give prompts or mini-assignments to ensure students have fully prepared for in-class activities. One way to keep the lesson current is to crowdsource the contemporary content by assigning individuals or teams to find recent works that build on experimental practices of the earlier period. 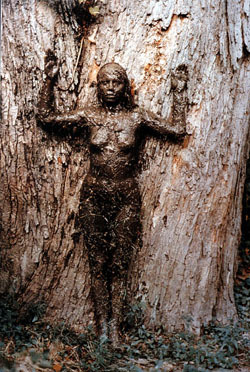 Ana Mendieta, Tree of Life, 1977. Art21: PBS mega-site on contemporary art. Features video interviews with artists, a critical blog, and an encyclopedia of artists and related information. ArtBabble: A “channel” combining video content from major museums. Allows browsing by art period and style, medium, and museum. Hosted by Indianapolis Museum of Art. Artsy: An online database of contemporary artworks and content developed in partnership with museums and galleries worldwide. Hyperallergic: Serious and playful art commentary. Khan Academy (Art History: Toward a Global Culture): Formerly Smarthistory, this site includes short videos and essays contributed by scholars with expertise in all areas of art history. Content-based quizzes offer students good self-assessment/study tools. Below are discussion points and examples of artworks for a class on this period. Links in the text access external sites for information about specific artists and concepts. Links in the Slide List provide additional details about each object on the related Slideshow. These resources are appropriate to share with students or for teacher preparation. Because many of the examples require explanation and will likely raise questions from introductory level students, instructors are encouraged to devise ways to focus in depth on selected objects. How does this object show the influence of earlier artists of the post-1965 period? How does it depart from these earlier practices in either form or meaning? How does it reflect (or not) its historical context? Body and Performance Art: a range of creative practices that employ the human body as the primary material of art, often known through photographs, video, or other means of archival documentation. Conceptual Art: Conceptual Art refers to a number of artists working in the late 1960s and 70s who emphasized the initial concept over their final artist product. The term may also be applied more broadly to any artists with more conceptual interests. The “Dematerialization” of Art: Lucy Lippard and John Chandler coined “the ‘dematerialization’ of art” to describe numerous art practices emerging in the mid-1960s that diminished or eliminated the material object of art. Earthworks/Land Art: Artworks that exist in the natural landscape or that employ environmental elements, Earthworks and Land Art emerged amidst the conceptual and process-based practices of Post-Minimalism, although the terms are often applied more broadly to any art of the past or present that highlights the relationships of humanity to nature. Feminist Art: A term used to reference the historical emergence of artists inspired by the Feminist Movement of the late 1960s and 1970s who explored ways to give artistic form to the political, social, and personal experiences of women, Feminist Art is a term more broadly applied to any artists who emphasize feminist issues or focus on the interests of women through their art. Institutional Critique: Offering social or political commentary, Institutional Critique is a strain of conceptual art practices that highlight institutional power structures and subvert traditional systems of display and exhibition. Minimalism: A distinctive style of abstract art that first emerged in the early 1960s to describe sculpture, Minimalism is sometimes used to describe related practices in other artistic media and disciplines. Pop Art: Developing in the early 1960s, Pop Art is characterized by its reference to popular culture and the mass media. Post-Minimalism: Post-Minimalism refers to many practices and artistic styles that emerged after the 1960s that were characterized by formal abstraction and an heightened interest in materials and issues of artistic process. Postmodernism: A set of related philosophical beliefs, critical approaches, and artistic practices that developed in the 1970s and 1980s, Postmodernism rejected the universalist assumptions of Modernism by exposing and deconstructing dominant ideologies. Relational Aesthetics: a term coined by Nicolas Bourriaud in the late 1990s to refer to a variety of artistic practices that encouraged human interaction and social exchange. This is related to the emergence of Social Practices art, which further build on these methods toward goals of political activism and social justice. Pop Art and Minimalism [Slide: Warhol and Judd] provided a catalyst for the new artistic formats that emerged in the mid-1960s. These emerged in a broad context of social unrest, characterized by student protests, anti-war sentiments, and the rise of the Feminist, Civil, and Gay Rights movements. The result was to dismantle established traditions and institutions of authority throughout contemporary culture. In a 1968 essay “The Dematerialization of Art,” Lucy Lippard and John Chandler acknowledged the shift away from painting and sculpture in favor of art that emphasized creative process and conceptual interests over the final object. Although terms “Conceptual,” Process-Based,” “Earth or Land Art,” and “Performance” are used to classify art of the period, these categories quickly explode into a network of diverse but related styles, practices, philosophical concerns, and interdisciplinary interests that anticipate the plurality of Postmodernism and late twentieth-century art. Although “Conceptual Art” derives from many sources, the words of Sol LeWitt are a good point of departure for this lesson. His quote that the “idea becomes the machine that makes the art” emphasizes a systemic approach to artistic process, which can be connected to Minimalism. (LeWitt, “Paragraphs on Conceptual Art,” Artforum 5.10 (June 1967): 79-83.) Projects like Incomplete Open Cubes (1974) demonstrate that simple forms can yield complex meaning based on the artist’s idea and highlight conceptual art’s privileging of the process used to realize an idea instead of its material form. LeWitt’s work opens up discussion of central themes of idea, language, process, form, artistic authority, and viewer interaction. Taken to the extreme, conceptual artists such as Joseph Kosuth and the British Art-Language collective often eliminated the material object and instead presented their ideas through language itself. Artists like John Baldessari relied instead on photographic or other methods of documentation to record their creative process and to raise issues around artistic authority, the role of institutional context, and the commodity value of art in culture. Examples underscore the point that while some conceptual practices yield a residual object (like Baldessari’s “cremation wafers”), others—like those involving bodily performance or ephemeral materials—are known primarily through the archival evidence that remains. Eleanor Antin’s Carving: A Traditional Sculpture (1973) highlights the intersection of conceptual practices with body art and performance and their relationship to emerging feminist interests of the period. Antin’s work addresses traditional representations of women, cultural ideals of female beauty, and her dual role as an object and maker of art. This example is a conceptual work of art, based on Antin’s initial idea to show the physical changes in her body over 37 days as she lost ten pounds, a process that she systematically documented through a series of photographs. It might also be considered a performance, done privately using the artist’s body as its medium and made public through the archival photographs now exhibited in the gallery. Hans Haacke employs similar documentary methods to present social and political commentary in a conceptual approach sometimes called Institutional Critique. Given the dramatic changes of the late twentieth century, many artists like Haacke have found ways to embed political meaning through a variety of conceptually based practices and styles. Working in Germany in the years after World War II, Joseph Beuys combined these methods with a rich system of iconography toward his belief that the artist’s creative power could be the source of social well-being and spiritual healing in a time of cultural strife. Beuys’ student Gerhard Richter achieves this goal through paintings that engage with traditions of photography and abstraction to challenge historical and cultural memory. Artists of The Pictures Generation such as Barbara Kruger relied on Postmodernist strategies including appropriation to expose ideological content that permeates visual culture in a media-saturated world. The role of the mass media and advertising is further reflected in work by the Guerrilla Girls or Banksy, who remain anonymous while displaying their work in public contexts. Other artists like Suzanne Lacy use live performance to raise awareness of societal issues, and provide an historical impetus for the rise of Social Practices in contemporary art that combines artistic intervention, political activism, and collective action to effect social change. Like Antin and Lacy, a number of female artists of the 1970s turned to body art and performance as a powerful way to assert artistic and individual agency. Inspired by the Feminist Movement, the pioneering work of Carolee Schneemann and Ana Mendieta finds a parallel in younger artists like Cindy Sherman, Catherine Opie, Lorna Simpson, and Janine Antoni, who combine their use of the body with photography and other media to explore ideas of gender and sexuality. The body appears as a key theme in much art of the late 20th century for artists interested in issues of identity, physical perception, and human interaction. Marina Abramovic‘s work Rhythm 0 (1974) and the works of Bruce Nauman demonstrate how artists explored these ideas through a broad range of media and forms that remained grounded in the artist’s, and/or the viewer’s, physical experience. Ann Hamilton, Matthew Barney, and Tim Hawkinson demonstrate how contemporary artists have expanded on these ideas by staging elaborate installations and addressing the increasing role of technology to augment bodily sensation and perception. The AIDs crisis that began in the 1980s and a growing emphasis on multiculturalism in the 1990s led artists to reference the body in direct and indirect ways. Felix Gonzales-Torres’s Portrait of Ross (1991) demonstrates how this generation of artists combined conceptual practices with minimalist form and viewer participation to create poignant works that hold personal and cultural significance. In the 1970s, the body became central to essentialist feminist thought, which distinguishes women’s experience according to female biological characteristics. Artists involved with the Woman’s Art Program at California Institute of the Arts celebrated women with art that highlighted female domestic roles and taboo subjects as menstruation in their landmark exhibition Womanhouse. Works like Judy Chicago’s The Dinner Party (1974–9) raised awareness of women’s significant cultural and historical contributions by validating the importance of women’s domestic life and social networks and rejecting fine art practices in favor of ceramic painting, embroidery, weaving, and other craft arts traditionally done by women. The theme of the body also recalls the emphasis on process that emerged alongside conceptual art in the 1960s. For many artists inspired by Minimalism, the creative act and its relationship to a chosen media became a focus for both formal and conceptual experimentation. Richard Long’s A Line Made By Walking (1967) is a good example to discuss how conceptual and process-based practices of the period are intertwined and may lead to a discussion of earth art and other ephemeral types of artwork. A formal comparison of Long’s photograph to Barnett Newman’s use of “the zip” (see: Art Since 1950, Part I) reinforces existentialist and spiritual interpretations related to humanity’s connection to nature. Robert Smithson’s Spiral Jetty (1970) serves as a canonical example of earth art, highlighting the emphasis on process, site-specificity, and broader questions around institutional context, geologic time, and man’s place in nature. Richard Serra’s Verb List (1967–8) illustrates the conceptual impetus behind his process-based sculptures of the 1960s, and relates to Serra’s later works such as Tilted Arc (1981) or series of Torqued Spirals and Ellipses. Serra’s formal interest in abstraction can be compared to female sculptors such as Eva Hesse and Jackie Winsor, whose use of organic materials and bodily references inspired feminist interpretations in their work. Likewise, for instructors wanting to raise additional issues of censorship and public art, a comparison of Tilted Arc to Maya Lin’s Vietnam War Memorial (1981) can yield good discussion. Like our world in the twenty-first century, today’s art is characterized by the multiplicity and connectivity of globalization. For example, Yinka Shinobare and Xu Bing make art that blends Western practices with non-Western traditions and reflects the intermingling of different cultures, and Julie Mehretu’s large-scale paintings resemble visual maps that suggest the overlapping histories and pathways that connect us all. What we find is that contemporary art history is a topic, possibly a field, that is currently under construction. For students, this presents an exciting opportunity to observe, examine, and perhaps contribute to the development of a new area of scholarship and to its potential effects on established views and practices in the discipline of art history. Have students brainstorm key themes in art since 1950 (perhaps treated holistically with Art Since 1950, Part I). What new themes do they think will be important to artists in the next five years? In the next twenty years? In the next century? Create a visual concept map that draws lines connecting different artists of the contemporary period (1950–present). Have students look for common influences, materials and practices, and issues explored by artists of this period. How might this map differ from similar maps made for earlier periods? What other contemporary art forms not discussed in this class do students enjoy? How might these reflect (or not) ideas and interests of the contemporary artists we’ve studied in class? This might include film, music, animation, illustration/graphic arts, video games, design, or fashion. Can students make a case for why they might be included in the study of contemporary art history? Based in Washington, DC, Virginia B. Spivey (author) is a contributing editor at AHTR and co-founding editor of Art History Pedagogy and Practice. As an independent art historian, educational consultant, and mother of twins, she keeps busy. Her current projects can be found on her website, Teaching with the Lights On.